So if you have been using Mailchimp with WP Email Capture free and wish to upgrade to WP Email Capture Premium, you may be wondering what you need to do to get Mailchimp fully integrated with WP Email Capture Premium. Don’t worry, setup is easy, as this article will talk you through the process. This article presumes the following. You have created a confirmation page on your site. You have a list created in Mailchimp. Within WordPress, scroll down to WP Email Capture > WP Email Capture Lists. Click the “Add External Lists”. Give the list a name, and paste in your confirmation page URL into the box as shown. Leave the “Code for the Capture form” box for now. Click save. You may ask why there is no “Subscription Page” URL? Truth is as this is a one size fits all approach to integrating mail services within WordPress, many subscription services don’t allow a redirection to a subscription page. As such, having this in confused a lot of beta testers. In a later version, I am looking to re-introduce this, based on the mailing list software that is used. Within Mailchimp, select Lists and click the “Forms” link under the list you wish to choose. Half way down the page is a drop down menu, select Confirmation “Thank You” Page and then paste your blog’s confirmation URL into the box. Click save. As an aside, if you have a Subscription page, you can choose the Signup “Thank You” Page option and paste in your signup URL into there. However, bear in mind, whilst potential subscribers will be shown this page when signing up to your site, they will not be tracked. For usability reasons though, I do recommend doing this. Following Step 2, click “Share It” (located on the grey bar three along from “Build It”), and then click “Create form HTML”. My personal favourite is the “Super Slim Form”, but you can use any of the selections down the left hand column. 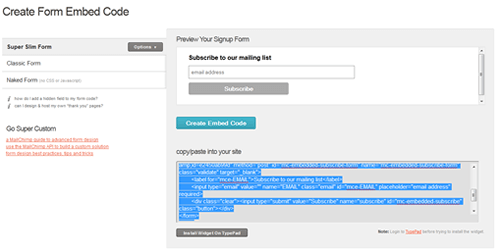 You can now embed this Mailchimp form anywhere on your site, be it a page, widget or post. If you have any questions, or wish to show off your Mailchimp integration, please share so in the comments!